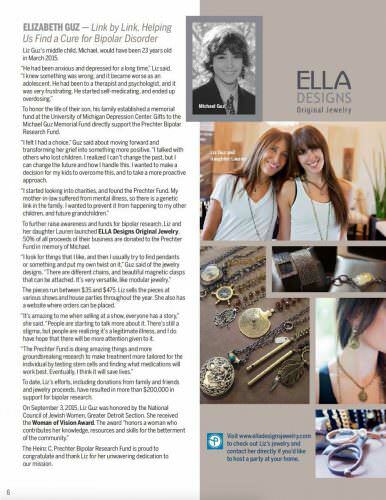 Elizabeth Guz established ELLA Designs Original Jewelry with her daughter Lauren. 50% of the proceeds are donated to the Heinz C Prechter Bipolar Research Fund at the University of Michigan Depression center in hopes of finding a cure. This month, Ella Designs is featured on the Prechter Fund website, highlighting Elizabeth and Lauren’s story. Ella Designs is proud to share that to date, their efforts including donations, have resulted in more than $200,000 to support bipolar research.